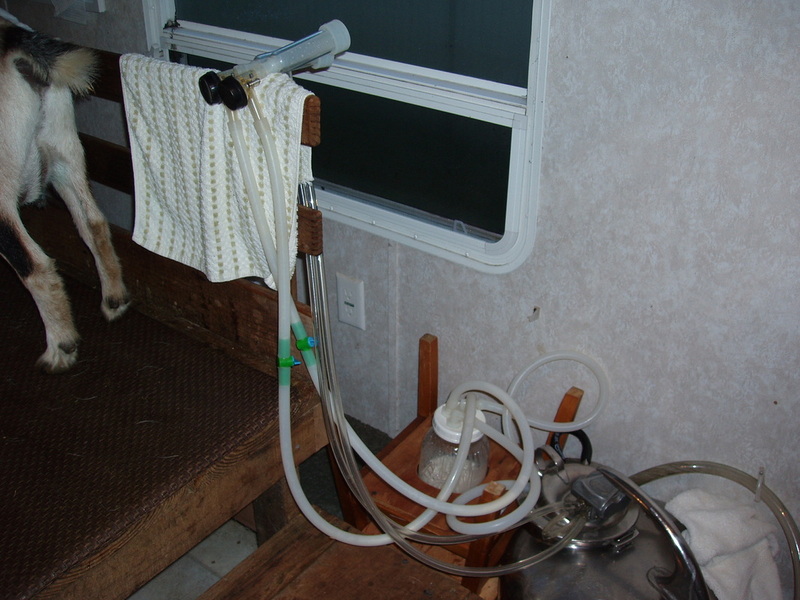 This is some photos of our milk room -the converted small travel trailer and the way it is set up to work for my milking. 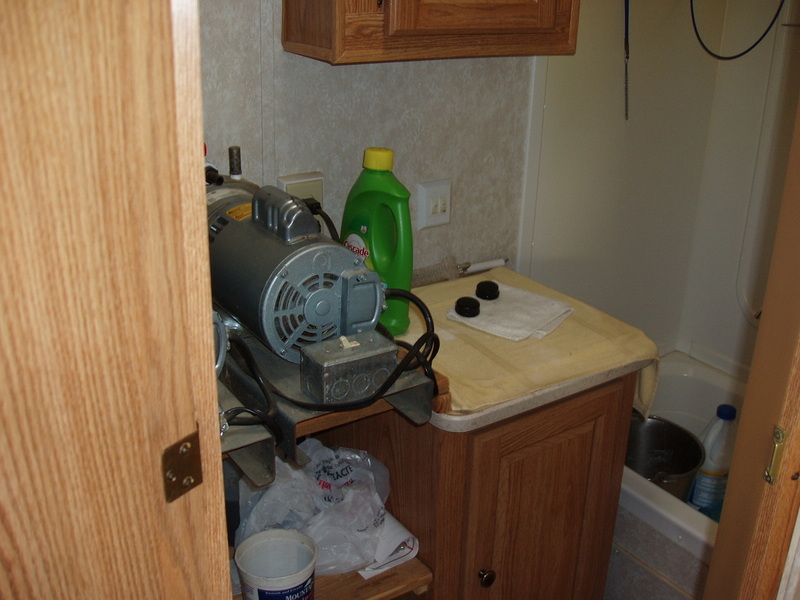 ​This is the small bathroom with sink covered - the pump on it's shelf and a storage shelf all above the toilet. Shower stall to the right . rubber kitchen mats on the floor and on the stancheon. This helps stop the tile floor from being slippery. 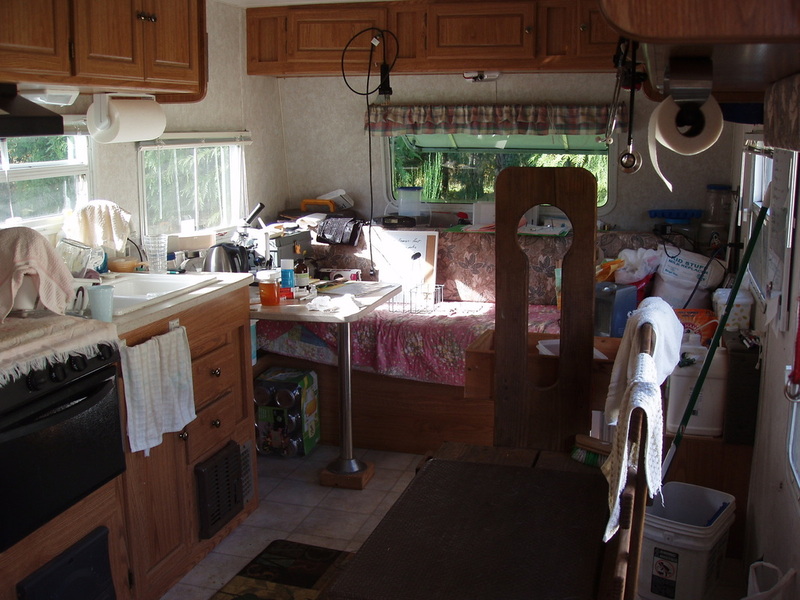 The camper kitchen is right opposite the stanchon - easy for washing up. We removed only the bench seating at the table opposite the sink area -moved the table down just past the sink counter and put the stanchon where the table originally was. The table fit perfect in this spot -still left a couch that seems to be the shelf for lots of items. There is a board across the top of the stove to make it into a counter. This is the lid for my large canning jar - They are the screw on lids for canning jars you can buy anywhere canning supplies are sold. 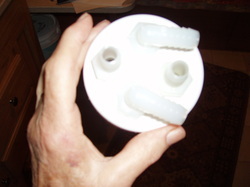 My husband drilled 4 holes and used nylon fitting for the hoses. Two for milk lines and two for the vacuum hoses from the pulsator. He made me several of these so I have extra on hand. 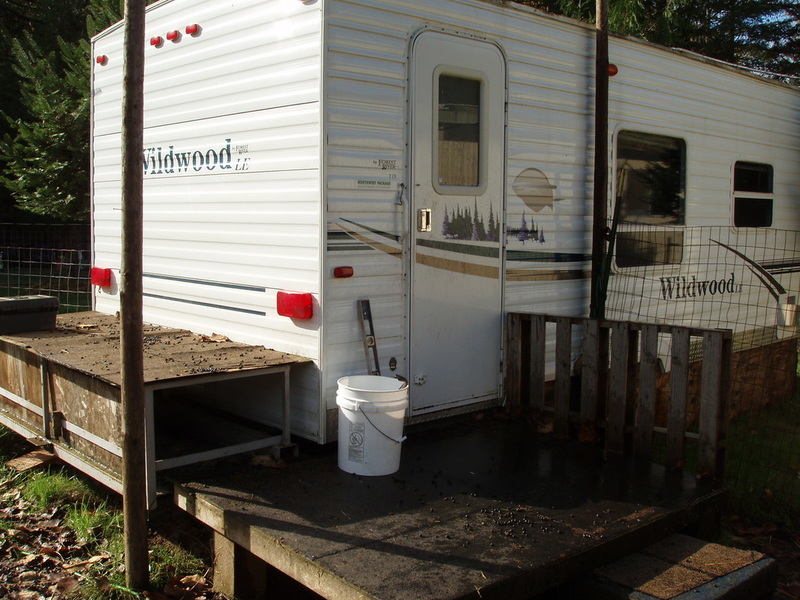 The camper shower makes a perfect place for me to wash the lines and hang them up. 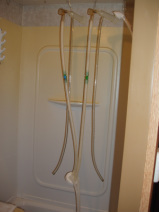 I moved the shower rod to the middle of the very small shower stall and use the shower hooks for hanging up the lines. My husband removed the sink and covered the hole with a board -it is my spot for holding soap - bleach - and a drying spot for the claw ends. 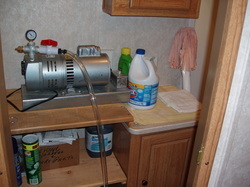 Beside the sink is a shelf to hold the pump -elevating it above the milking machine and the door does help muffle the sound a little. dishwasher soap and bleach solution. In this picture you can see the surge milker and the conversion bottle. 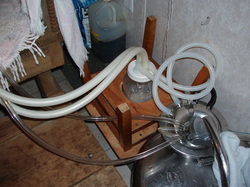 The hoses to the surge pot need to be elevated so that no milk can flow into the pot. We used a small stool -upside down with a frame board to hold the bottle. To clean I remove the hoses from the pulsator and the pot - unscrew the bottle from the cap on top - strain into a quart jar and put in the fridge - and start washing the hoses. My girls get lots of attention during their milking so I never lost that personal time with them. I always check the surge milker pot for any moisture and crack the lid open a little with a clean cloth over it when not in use. I have seen drops of moisture in there from time to time. I often wipe it out with a bleach rag to make sure no mold could ever be there. A TRAILER MAKES A GREAT MILK ROOM. I was wanting to have a milk area away from the barn and at this time we were trying to sell a camper we no longer were using. Decided it would make a milk room and has been so great. It's wheels were removed and it is boxed in as the little babies all hide under it. One of these days I will get to painting the boxed in area. ​ All the animal supplies are now in one place and I no longer have to try and remember where I put things. The barn, house or hay room. My husband has made a roof that extends out over the trailer and to the barn and gives a dry place for the goats to come to their milk room. 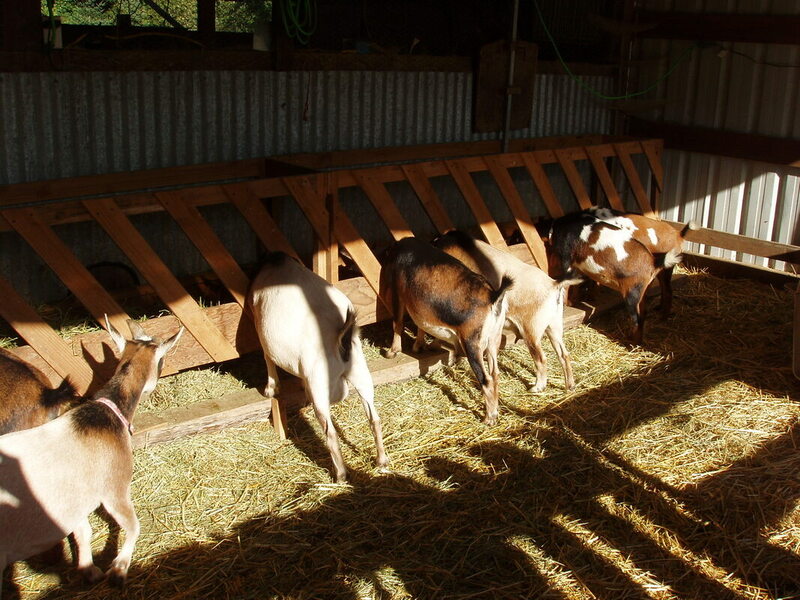 As most of you know - the goats have a real trama to walk in the rain and we gets a lot of it her in W. Oregon. ​Several times I have been asked how we set up the trailer so thought this page might help explain. We had a box on the back of the trailer for crab pots etc when we were camping - now it is a covered shelf that the goats love to lie on and babies like to hid under. The posts are here along with the tools and ladder as my husband is in the process of building the roof to connect to the barn area so that my sissy girls won't have to walk in the rain. They think they will melt. I just open the door and call by name -they come running. As you can see by the picture - the stanchion is on the right - removed a table and bench seats from there. The table is at the end of the counter - over the bench seat by a little. 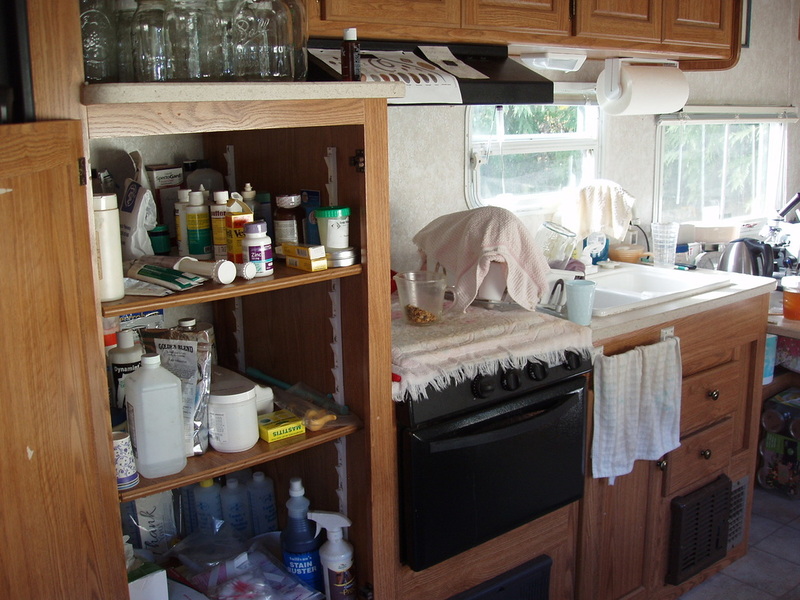 The seat makes a good storage place and the cupboard holds all our animal supples in one place. There is a fridge to the left of the cabinet that is open. Hold quite a few milk bottles. Our stanchion has a removable side (can go on either side). 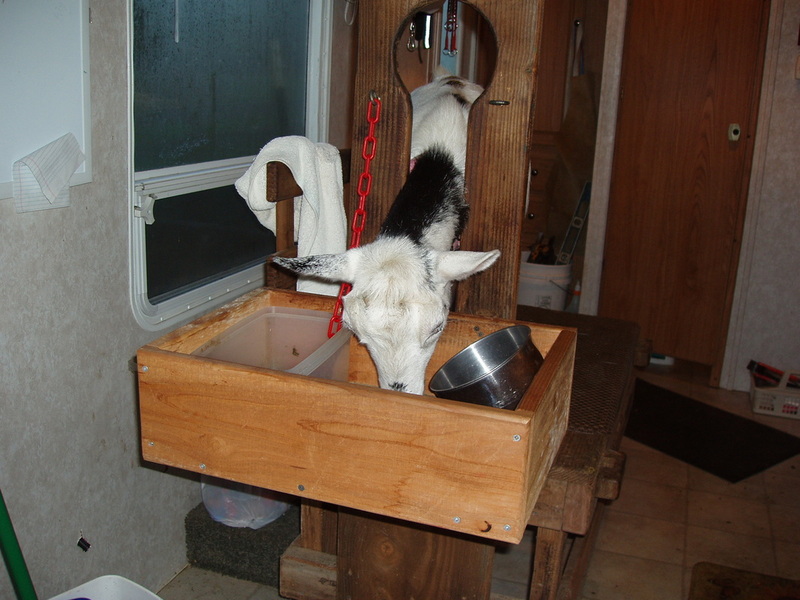 I always worried that a goat balking hoof trimming or whatever would slip off the stanchion and get hurt so the side is a blessing and a good place to hang my milking equipment. The milking machine, (a converted Babson surge milker) is sitting right beside the stanchion and the side on the stanchion works great for holding parts of it. I bypass into a half gallon jar and no milk goes into the heavy pot. There is more detail on the milking machine on my other page. 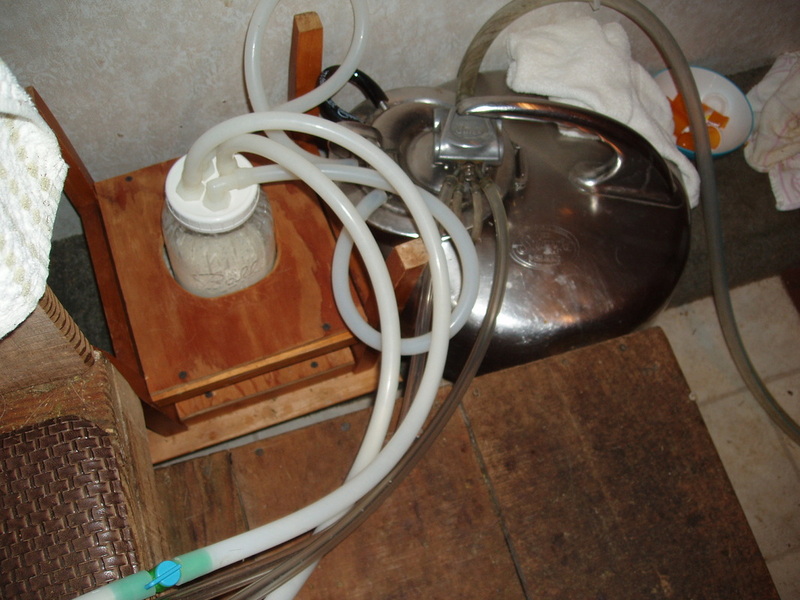 ​The small bathroom works well for my cleaning of milk machine. Shelves cover the toilet area and hold the pump. 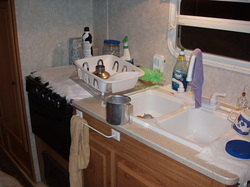 The sink was removed and is now a shelf to hold things and the shower is used for washing the hoses and handing them up. I moved the shower attachment to the middle of the tub and hang my hoses up there to dry. The door does help a little to muffle the motor sound. ​Good luck on your addition of a milk room if you decide to try this. 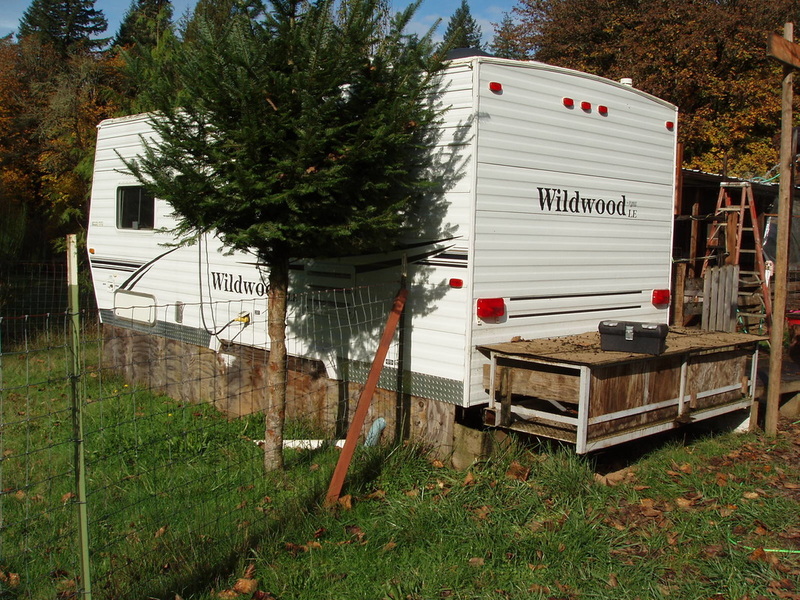 A second hand trailer is less expensive than an addition to the barn is what we thought. ​Feeder that seems to work the best for us. We have had so many styles of feeders over the years and waste is always there. Here is a design by Harvey Considine ​that seems to work very well. My husband built one along a wall and also a free standing one. The babies love to crawl under the wall feeder. Good hiding place. 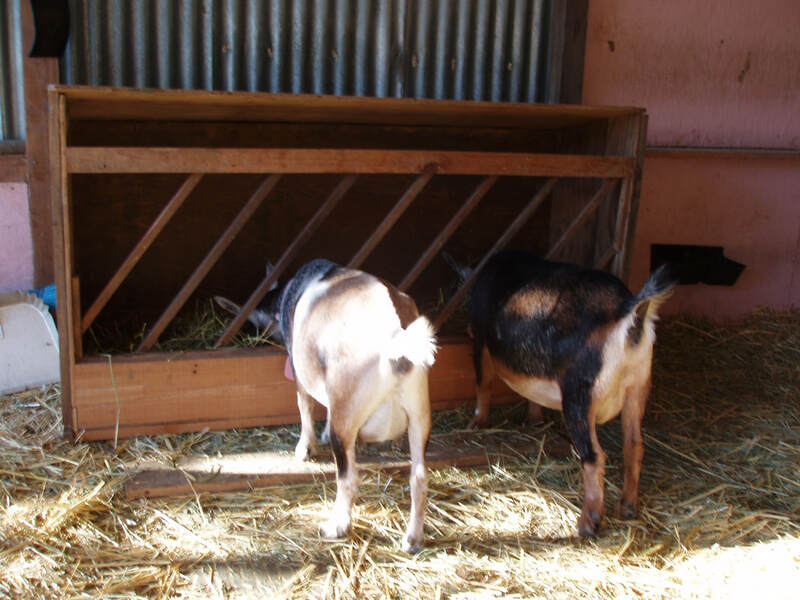 It seems that the boards on the slant keep them from pulling the hay out and really cut the waste down to nothing.